Get 15% discount in "Organic Vanilla Chai Tea 20 Tea Bags" and save £0.50. A cup of fairly-traded sweet organic vanilla tingling with cinnamon and ginger. Enjoying a hot cup of tea after a long day is an excellent way of recharging the mind and the body. 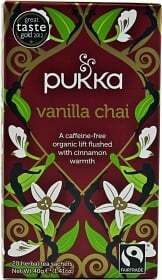 Pukka presents an all-organic, caffeine-free tea that is infused with sweet vanilla, cinnamon, and ginger, which will energize your senses in an instant... try Pukka Vanilla Chai Tea! Pukka Vanilla Chai Tea gives you that much-needed boost of vitality with its combination of energy-giving herbs. This organic tea is best consumed in the morning to start off your day, or at night after going through a stressful day. Vanilla, cinnamon, and ginger work together in enhancing your libido and boosting your energy. These herbs also promote excellent digestive health and function, making it a suitable tea to consume after you enjoy a heavy meal. Pukka Vanilla Chai Tea is also infused with cardamom, fennel, and licorice, which will cleanse and detoxify your system, curb your appetite, and provide relief from digestive issues, such as bloating and gas. Treat your taste buds with the sweet goodness of vanilla tea and get yourself revitalized at the same time... try Pukka Vanilla Chai Tea today! Have a question about Vanilla Chai Tea? What is it, what does it do, how and when to use or something else? Ask us. Ingredients: Naturally caffeine-free and ethically sourced, 100% organically grown ingredients:, Cinnamon bark (40%), ginger root, licorice root, cardamom pod, sweet fennel seed, vanilla pod (2%), vanilla flavour (2%).